In the last three posts in this series, we played with addition tables, multiplication tables, and division tables, and looked at equivalence classes and representatives of each equivalence class. As promised, a look at subtraction, but let’s look at subtraction in an unusual way. Let’s suppose that we know almost nothing about subtraction, don’t know subtraction algorithms, don’t know much beyond that if I pay a certain amount for something (in cash), that amount has now been subtracted from how much cash I used to have. Let’s imagine that I’m in the supermarket check out counter line, behind somebody who is laboriously collecting all his change out of his many pockets and putting it down and counting it off till there is the needed $7.65 to pay for the purchases. You probably have been in this scenario more times than you care to recall. Note that it is rare in these situations for the purchaser to hand over the money to the cash register person piece meal. Rather, it is all collected and counted up to be $7.65, and then it is handed over as a whole. Only after the counting-up is complete is the money handed over, and only at that moment is the purchase complete, and the subtraction of $7.65 from the original amount of cash has been accomplished. Let’s think some more about how this machine views the world. It doesn’t know if you have enough money to complete the purchase, and it doesn’t care. At no point does it extend you credit. When you start the process of purchasing a drink, you may not know if you have enough money in cash either. The machine doesn’t care if you know, either. It offers you the “Cancel” button so you won’t get unduly upset with it, but until the balance hits zero, nothing is settled either way, and everything is still reversible. But just because nothing has yet been settled doesn’t mean that no work is being done. The machine is counting down for you – telling you how much you still need to put in before you will get that drink. Though the machine is counting down, it is not doing your subtraction for you: it doesn’t know how much money you had before you started and it doesn’t know how much money you end up with. All it knows is how much more money you need to put in before it parts with the soft drink. Now let’s make one more assumption, and that is that we encounter this machine in a strange country, in which there is only one kind of coin, and in which all money is expressed as a whole number of those coins. So instead of coins that say 1, 5, 10, 25 cents, they have one coin that says 1© and when you select the drink the screen shows 9©. This tells you that you need to put in 9 of those 1© coins. Each time you’d put in one of those coins, the number on the screen would go down by 1. If you started with 22 coins, what would you end up with? Let’s follow the journey: after putting in one coin, you’d have 21 left, and the machine tells you that you have 8 more to pay. So: whatever 22-9 is, it is the same as 21 – 8. We can write this as: 22 – 9 = 21 – 8. Similarly, 22-9 = 21 -8 = 20 -7 = 19 – 6 =18 – 5 = 17 – 4 = 16 – 3 = 15 – 2 = 14 – 1 = 13 – 0 (and this is the moment your drink pops out and you’re left with 13 coins. In this table we’ve given up any pretense that we are supplying direct answers. The entries in the table show the particular subtraction that we’re interested in. The entry for row 6 and column 2 gives “6 – 2”, so this is the entry for subtracting 2 from 6. The table on the top right shows us some equivalences, based on the idea of the Pepsi machine equivalences. If we were to start with the entry 9 – 3, we could think of this as having 9 coins in the pocket, and the machine telling us we need to put in 3 more. This doesn’t mean we are buying something that costs 3 coins, after all, we may be looking at a moment in time during our purchase – may be we started out a while ago with 15 coins to buy a 9© drink. What we do know is that at this point we’re down to 9 coins in the pocket and down to only needing to put 3 more coins into the machine. When we put one more coin into the machine, we will be down to 8 coins and the machine will tell us to put 2 more coins in. So 9 – 3 = 8 – 2. This shows us how the equivalence classes work for subtraction: you find equivalent subtractions by moving up diagonally to the left. A blue arrow is shown from 9-3 to 8-2 to 7-1 to 6-0. The table on the bottom left shows us all the equivalence subtractions (for numbers from 0 to 9) and the entries that we’ve left in place are the ones we regard as the representatives of each equivalence class. Of these representatives, the ones on the left edge are the ones where the soft drink will come out, the screen indicating that there are 0 more coins to pay.) For these representatives, it is also clear how much money you’ve got left. For the representatives on the top edge, what situation do they represent? They all have the form 0 – something and so show the situation where you don’t have any more coins, but the soft drink hasn’t yet come out: the screen indicates that there is more coins to pay. 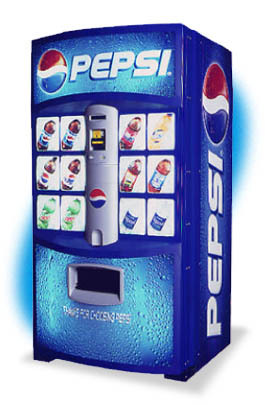 The Pepsi machine is patient, though – it will wait while you search pockets you didn’t know you had, or wait with you for other hotel goers to stroll by who are willing to give you coins. Though you can still cancel at any point, your current situation is pretty clear: 0 – 3 means you need three more coins before your drink will come out. The Pepsi machine doesn’t care. The diagram on the bottom right shows the standard abbreviations for the representative situations. The column of the form something – 0 connects with the world you knew even before you knew anything about subtraction. In fancy language, we’d say that we identify something – 0 with something: we’ve now anchored this new notion of subtracting one number from another, through the notion of equivalences, to the kinds of numbers we already knew. 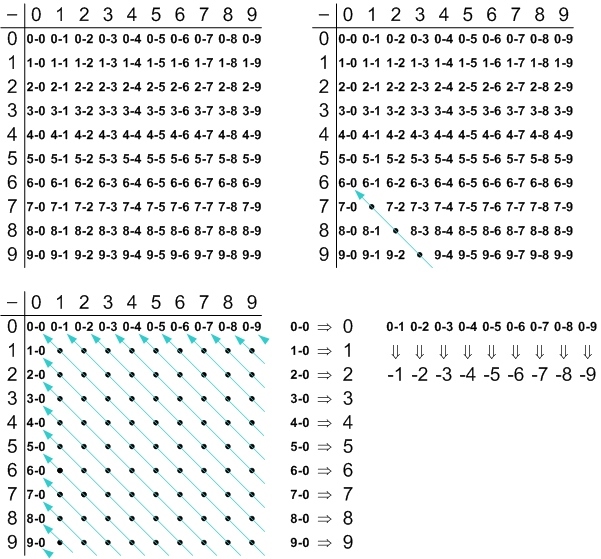 Conversely, the row of the form 0 – something creates a new world, and a new kind of number, negative numbers, in a way wholly analogous to how the other subtractions were handled. Though strange enough, these new numbers feel less strange, and act less strange, to the ext that we can see them as a straight extension of the numbers we were already familiar with, through this particular notion of equivalence classes. The fancy way of saying this is that “-6” is the name for the equivalence class of all the subtractions p-q where the value of q is six more than the value of p. In a similar vein, we could say that “6” is the name for the equivalence class of all the subtractions p-q where the value of p is six more than the value of q. The notion of introducing new kinds of numbers or new kinds of mathematical objects through picking representatives of equivalence classes is a very productive one. In the next post we will look at an example of modulo arithmetic to play with this idea some more.